You are going to need cedar planks for today's fish recipe. Soak planks for 30 minutes before you fire up the grill. Make sure the grill is good and hot, this is key! 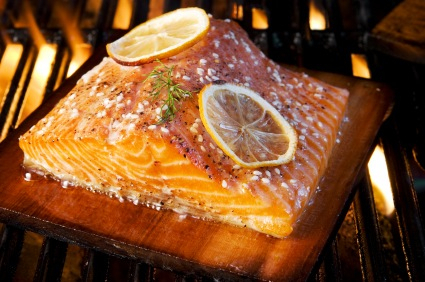 Cedar planked fish takes on a wonderful smokey flavor with more flair and a lot less hassle. The plank will be charred, but the fish will be perfectly cooked. This technique of cooking on planks is not new. Developed by Indians in the Pacific Northwest, cooking on cedar and alder has been a tradition for centuries. Pick up some cedar planks at your local hardware store. Oh, please be sure they are untreated non-resined wood, no thicker than 1 inch. Cedar and alder are popular choices, but mesquite, cherry, peach, apple, and oak also add their own unique flavors. Enjoy! Soak plank in water to cover 1 hour; drain. Rub plank with one tablespoon olive oil. Place fillets on plank; season with pepper, parsley, syrup and lemon juice. Top with remaining olive oil. Grill 10-14 minutes or until fish is cooked. The thickness of the fillets will determine final cooking time. Prior to serving top with fresh butter and serve with extra fresh lemon slices.